Fall is a happy season for me. With the harvest of fall vegetables and fruits, my cooking takes on new flavors. One of the vegetables that I absolutely love is butternut squash. From the first time I tried my hand at cooking it, I haven’t been able to get enough. 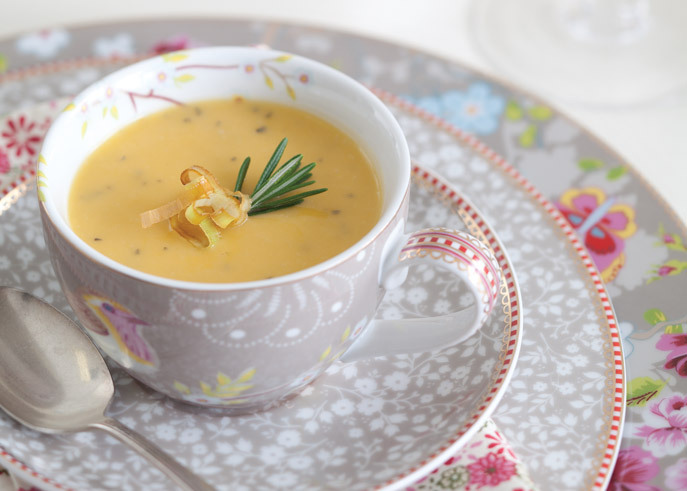 Butternut Squash Soup is always a winner with me. It is one of those comfort foods that we enjoy on a brisk fall evening. I especially love the flavor of roasted butternut squash. I peel it, toss it in olive oil, and put it on a baking sheet. Then I roast it for about 30 minutes on 350° or until tender. From roasted varieties to mashed to a fresh dip, there are many great recipes using butternut squash that our test kitchens have developed. Below is one of my favorites from Cooking with Paula Deen. 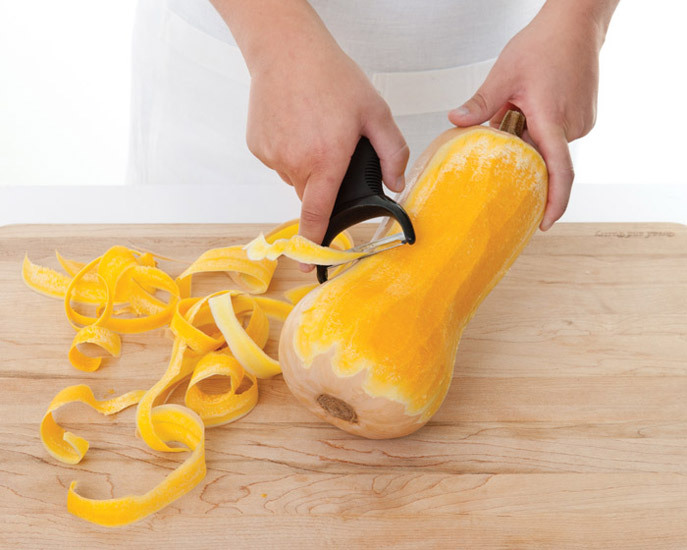 Our test kitchen professionals have created a handy how-to for peeling and dicing your butternut squash. Cut off root and about 2 inches of dark green portion of leek. Cut in half vertically, and separate layers under cold running water to remove grit and sand. Drain well, and thinly slice. If frying leek for garnish, reserve about 2 tablespoon sliced leek, and separate into individual pieces. In a large Dutch oven, melt butter over medium heat. Add leek; cook for 4 to 5 minutes or until tender. Add flour; cook, stirring constantly, for 2 minutes. Stir in broth, squash, rosemary, and salt, and bring to a boil over medium-high heat. Reduce heat, and simmer for 10 minutes or until squash is tender. Transfer soup in batches to the container of a blender, and attach lid, removing center piece of lid so steam can escape. Place a towel over lid to avoid splatters, and process soup until smooth. Return soup to pot, and stir in sour cream. Garnish servings with rosemary and fried leek, if desired. To fry leek: In a medium skillet, pour oil to depth of 1⁄2 inch, and heat over medium heat. Fry reserved leek for 1 to 2 minutes or until crisp. Let drain on paper towels. Do you have a favorite fall fruit or vegetable? What do you love to make with it? Phyllis, thank you SO MUCH for sharing the video on cutting/preparing the squash. Most cooking segments have the squash already peeled and cut and I am always left wondering how to prepare the squash correctly without hurting myself and landing in the emergency room. The recipe sounds delicious, I will make a pot soon. Thank you again. The recipe sounds delicious. I’ll be trying it soon. The best squash soup I ever ate was made by Mikki Bond when she had Lemongrass Bistro. It was creamy and smooth with a bit of sweetness and hints of cinnamon, allspice and other autumn spices – perfect for a late afternoon pick-me-up on a cold, rainy afternoon. Good soup is truly comfort food. I also love squash. I always roast it then use it in soups, pastas, even appetizers. Because I’m lactose intolerant, instead of cream I add one cooked potato for creaminess. Sometimes I add apples and apple juice for a lighter version of squash soup. Has anyone tried raw squash? It seems to be the latest trend for salads,similar to carrot salad.Happy fall cooking everyone. My sister makes wonderful butternut squash soup, but I have never tried my hand at it. This recipe made me determined to try! For years my favorite method to prepare butternut (and acorn) squash is to cut in half, remove seeds and membranes, place cut side down in a baking pan, add half inch or so of water, cover with foil and bake at 350* until almost tender. Then turn cut side up, sprinkle with salt and pepper, place a generous pat of butter in cavity, add brown or raw sugar, finish with a grating of nutmeg and bake uncovered a few minutes longer then enjoy! Doesn’t fall give us a wonderful new lease on life?! My husband loves soups, I just put together his favorite Hamburger squash soup. Hamburger, onion, zucchini squash, yellow squash, red potatos, red bell pepper, celery, carrots, beef broth and seasonings. It’s simple and all in the crock pot for this evening. A loaf of hot French bread and it’s just a go to for us. I have several crock pots in various sizes for different meals. At the evening meal its simple and healthy. I’m now looking to collect more soup bowls and change the colors out for fall. The recipe sounds divine, but I can’t take my eyes off that lovely china pattern. What is its name? Squash is actually my favorite fall vegetable, together with leeks. This soup sounds and looks divine. Thank you for sharing it. Now if only our summer weather will realize it’s fall!